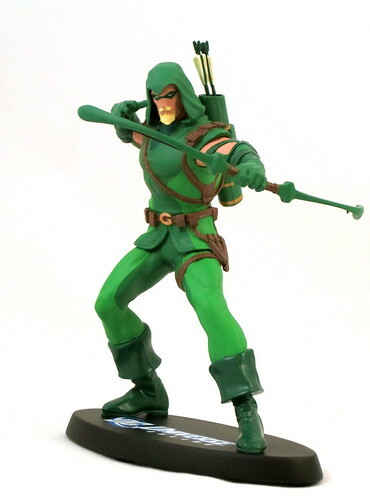 DC Universe Online Statues: Green Arrow Hits the Mark! Tonight I’m covering my first item from a new statue line. I can never be accused of not giving new products a go! The DC Universe Online Statue Series is not destined to become a regular purchase for me for a few reasons I’ll discuss in a moment, but if the DC Direct DC Universe Online Green Arrow Statue is anything to go by, I’ll be very satisfied with the pieces that I do decide to cherry pick from this line. I am pretty well stocked up on statues of many of DC’s big names, but there are some characters that seem under-represented in the statue stakes to me - and Green Arrow would have to be at the top of that list. I came in to statue collecting too late to own the picture perfect Tim Bruckner DC Direct version of Oliver Queen, and since then we’ve only seen a Heroes of the DCU Mini-Bust of Green Arrow, which I do own. Add this to the fact that this version represents the Emerald Archer in his hooded uniform, and I was interested to see this statue in person. That opportunity came about when I visited Alternate Worlds in Windsor in Melbourne’s East, which sadly is closing its doors after Free Comic Book Day and relocating to the other side of the city. I had seen some of the other DCU Online Statues and appreciated the look of them, but not been interested in buying them as all of the characters previously produced are well represented in my collection. When I came in on this particular visit, my eye was immediately drawn to the newly in stock Green Arrow statue, and I left a few dollars poorer, but one statue happier. The sculpting and design on this piece are excellent. 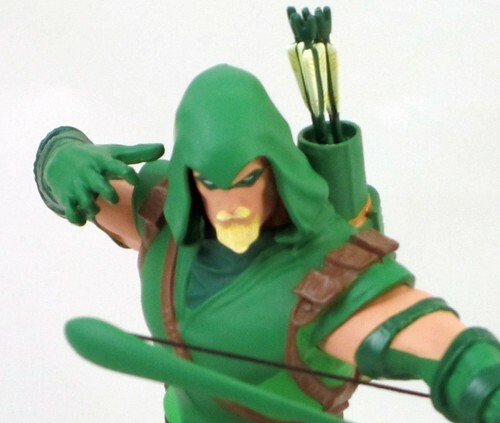 The pose is perfect for Green Arrow - he appears to have just shot an arrow from his bow, which even includes a string. There is a very pleasing amount of detail, none of which is blurred at this small scale - including GA’s shoulder straps, arm bands and of course his quiver and arrows. I have no skills as a sculptor, but I have seen enough statues to know that there is skill involved in creating a figure that looks like it’s wearing clothes as opposed to the clothes just looking painted on - not to say that look is never desirable - and this statue definitely displays the application of that skill. There is a sense of depth to the statue because all of Green Arrow’s gear and uniform have been given a great deal of attention. It’s a very nicely constructed piece all around. It was the colours of this statue that initially attracted my eye, which might seem surprising considering that the colour scheme is rather limited. The greens chosen for Ollie’s outfit are spot-on and beautifully painted. The whole paint job is flawless, and there is a fair bit of detail involved in Green Arrow’s uniform and gear, and everything from his quiver to the arrows its hold keeps all of its sculpted detail thanks to the excellent paint work. There are some nice textures created through the use of matte and glossy paints, enhancing that look of a clothed figure I mentioned when discussing the sculpt for this piece. Rather than being let down by its paint job as some statues are, this one is further enhanced by it. An obvious stumbling point for many with this line is that these statues come in at around the 6.75” in height, which is about the same as an average DCD action figure these days. As beautifully produced as they are, you’re still paying small statue prices for an action figure scale piece. DCD seems to have proven that people will buy smaller scale statues such as these with the success of their Batman Black & White Series, so perhaps they are hoping for the same here. Personally I would love to see a cohesive DC Universe Statue line in the 10-12” scale in the vein of what Bowen Designs produces for Marvel, but I realise that the cost involved would cut down the number of buyers considerably. This line may be a good entree to statue collecting for some buyers, and perhaps if it is successful we might see that larger line I’m speaking about somewhere down the road. As I mentioned at the start, my purchases from this line are going to be sparing until such time as the line hits more characters that haven’t really featured in DCD’s statue output so far (or until they make Aquaman...), but based on the quality of this statue, I won’t hesitate to make those purchases when the character is right. Despite the smaller scale of these pieces, this particular statue still gets DC Direct “well done” from me! You can see more pics at Facebook, discuss this at the AFB Forum and comment on this post to enter the May AFB Comment of the Month Contest! Sweet looking for sure but the price point scares me away. Nice Ollie figure! I'm still searching for my perfect GA piece. Are you still play the game no good to worry about it? Are you still play the game inside the game a lot a lot to cast a lot of money and frustration it? Come and join us! We play dcuo cash together. AFB Experiences the Domino Effect, Bowen Style! Yellowjacket buzzes in to the Bowen fold! DC Direct delivers a second dose of Poison Ivy!